A new study from McGill University, Montreal, has looked at the four most-commonly consumed types of milk beverages from plant sources around the world – almond milk, soy milk, rice milk and coconut milk – and compared their nutritional values with those of cow’s milk. After cow’s milk, which is still the most nutritious, soy milk comes out a clear winner. The popularity of plant-based alternatives to dairy has soared over the past years. The global market for alternative dairy drinks is expected to reach $16.3-billion in 2018, up dramatically from $7.4-billion in 2010, according to Innova Market Insights data. “The dairy alternatives market has seen rising levels of interest in recent years, spurred mainly by consumers increasingly looking for lactose-free, dairy-free and plant-based/vegan options as healthy lifestyle choices, rather than regarding them as simply for those with allergies or intolerances,” says Lu Ann Williams, Director of Innovation at Innova Market Insights. “The category has been further boosted by the growing availability and promotion of plant-based options to traditional dairy lines, particularly beverages, but also cultured products such as yogurt, frozen desserts and ice cream, creamers and cheese. “In the move to offer something new, we are starting to see an increasing variety of non-soy plant-based alternatives, including cereals such as rice, oats and barley, and nuts – such as almonds, hazelnuts and macadamias – as well as more unusual options such as hemp and flaxseed,” notes Williams. 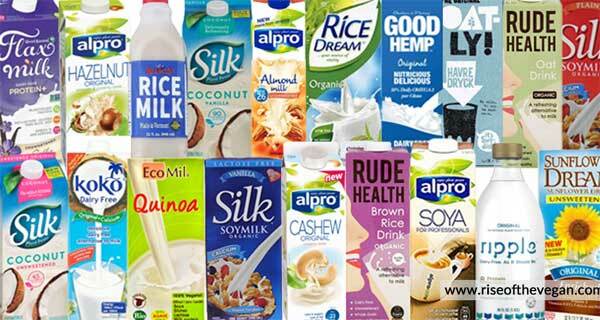 But how healthy are some of these dairy alternatives really? Little research has been done to compare the benefits and drawbacks of the various kinds of plant-based milk. For this reason, the researchers McGill University compared the unsweetened versions of the various plant-based milks and the figures left are based on a 240 ml serving. Their study was recently published in the Journal of Food Science Technology. Soy milk is widely consumed for its health benefits linked to the anti-carcinogenic properties of phytonutrients present in the milk known as isoflavones. Has been a substitute for cow’s milk for 4 decades. Concerns, however, are the ‘beany flavour’ and the presence of anti-nutrients (substances that reduce nutrient intake and digestion). Lactose free and can act as an alternative for patients with allergy issues caused by soybeans and almonds. Apart from the high carbohydrate count, a concern is that the consumption of rice milk without proper care can result in malnutrition, especially in infants. Nutritional values are reduced if stored for over two months. Almonds have a high content of monounsaturated fatty acids (MUFA) that are considered helpful in weight loss and weight management. MUFA also helps in reduction of low-density lipoprotein (bad cholesterol). Dairy is considered a wholesome, complete food, providing all major nutrients like fat, carbohydrates and proteins. Dairy can help humans by providing a wide range of host-defense proteins because various beneficial anti-microbial effects are found in both human and bovine milks (eg a study shows that in the case of infants, consumption of cow’s milk has considerably reduced risk of fever and respiratory infections). However, the presence of various pathogens like Salmonella spp and Escherichia coli O157:H7 in milk have been associated with disease outbreaks around the world. Cow’s milk allergy and lactose intolerance are among the most common allergies among infants and children affecting 2.2-3.5 percent of children (a greater percentage than those who are affected by peanuts and tree nut allergies). As many as 35% of these infants outgrow being allergic to milk by the age of 5-6, and this may increase to 80% by age 16. Lactose intolerance, due to the absence or deficiency of the enzyme lactase in the digestive tract, affects somewhere between 15-75% of all adults depending on race, food habits and gut health. Some studies have suggested that 80% of people of African origin and 100% of those of Asian and Indigenous American origin are lactose intolerant.